So how did it all start? Funny enough, the SigShield™ product realization process was born years ago from a fairly simple customer request. A customer asked if we could help convert their die cut EMI shielding gasket to a cost-effective form-in-place (FIP) gasket. While this wasn’t something we had done previously, or frankly even knew how to accomplish at first, we were intrigued by the technology and challenge. As we began researching the form-in-place gasket space, we discovered that the advanced manufacturing process and unique approach to EMI shielding could really help customers decrease costs and reduce lead times. Like any good story, it’s not all rainbows and sunshine. We had to work to develop the right processes to make SigShield™ what it is today. Our first FIP dispensing machine was a small desktop unit. Bringing the process in-house was a bit of a risk. It came with a learning curve we couldn’t have fully anticipated. It has, however, created many Modus™ memories that we all look back on and laugh about! A foundational element of our passion for being the obvious choice was alive and well as we innovated in those early dispensing days! Two of our top problem solvers, Dave Elliott and Mike Carson worked late nights learning how to operate our first dispensing machine. We are still to this day, incredibly proud of the dedication they put into the project. We made a commitment to the customer, and nothing was going to stop us from coming through! To make for even more manufacturing-fun, the desktop-unit was a manual teach-type system! Meaning, we had to manually move the dispensing head to teach it where we needed the bead dispensed. Note: Dave and Mike have been pleased to see a progression into CNC dispensing equipment over the last six years! Our Partnerships: Full Strategy with a Hint of Happenstance. We believed very early on that if we were going to dive into dispensing form-in-place gaskets, we had to surround ourselves with “only the best.” The strategy applied to materials, equipment and of course the craftspeople who make it happen every day for our customers. The strategy has served us well! As we recognized the potential of and continued to meet the demands for FIP manufacturing, we moved from the single tabletop machine to a portfolio of Datron dispensing machines. 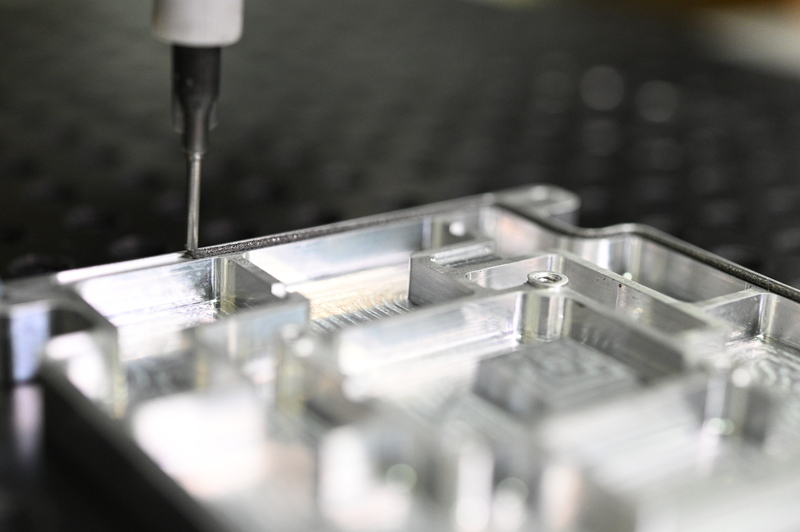 Suffice it to say, our CNC driven Datron machines truly set the standard in the industry. In choosing whom to partner with for FIP materials, we chose a Sweden-based firm that we found through a bit of happenstance. While flipping through a trade magazine, we happened to see a company named, Nolato Silikonteknik. At the time, the Silikonteknik division of Nolato did not have a U.S. presence, which intrigued us. The more we researched and studied Nolato and their FIP gasket technology, TriShield, the more we wanted to know. So much so that we flew to Sweden to learn more about their processes, products, and systems. By the time we were done with our visit, we knew Nolato would become a long-term Modus™ Core Supplier. Nolato’s expertise and support were instrumental in the growth of our dispensing business. As Nolato’s North American Production Partner, we now stock and process many of their most popular form-in-place materials, including TriShield 2.0. As our dispensing process matured, customers started asking if we could provide turnkey machined RF shields. Through our customer relationships, we learned offering turnkey machined RF shields would fill a need in the market. In other words, customers were asking us to adopt a one-stop-shop model. Initially, we outsourced some of the machining, but because we believe in our methodology, Idea to Ignition®, we wanted to reduce the number of hands that exchanged responsibility during the manufacturing process. We decided to start machining RF shields in-house. The benefits created, the partnership with Nolato and our application of Idea to Ignition® provided so much value, we decided to give the product realization process a name, you guessed it, SigShield™. SigShield™ is a product realization process that results in a product. One we’re darn proud of! What do you mean when you say “the SigShield™ product realization process”? Great question! Glad you asked! We leverage vertical integration, a 4-step Idea to Ignition® methodology and premium Nolato Trishield form-in-place gasket materials to deliver custom turnkey machined RF shields in half the typical time. In short, SigShield™ is the combination of a methodology, premium FIP products, and customer benefits. The process results in your custom turnkey RF shield. Your design, our process! By controlling the entire process, Modus™ proudly takes responsibility for lead times, quality and delivery of every custom RF shield manufactured using the SigShield™ product realization process. Only turnkey machined RF shields manufactured by Modus Advanced, Inc.™ go through the SigShield™ product realization process. Would you like to learn more about SigShield™?